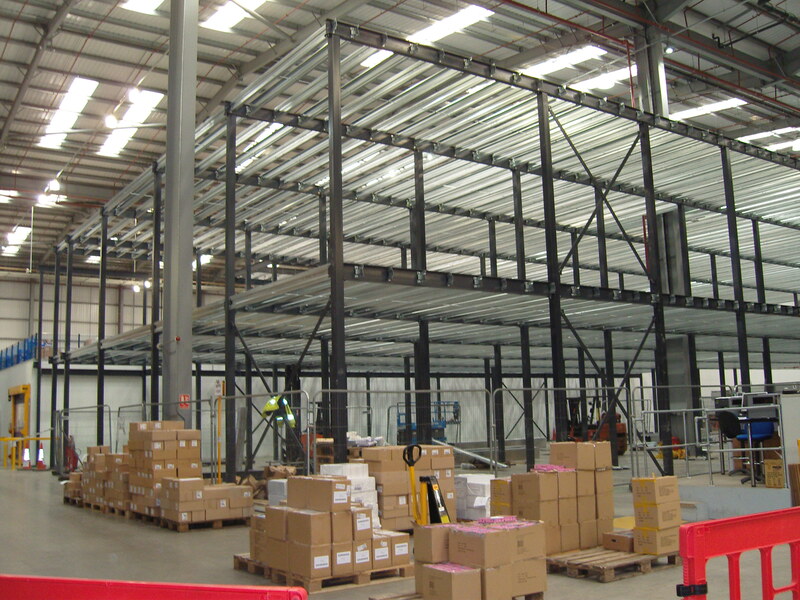 Storage Concepts Ltd installing a large 2/tier Mezzanine Floor in Lancashire in a large distribution centre 64 m long x 23 m deep per level = overall mezzanine floor storage capacity = 2944 m2 ( 31,700 ft2 ) Mezz guard edge protection, goods lifts, escape staircases, partitioning systems are going to be installed as part of the overall package. Storage Concepts’ mezzanine floor team have a wealth of experience when it comes to the designing and installing of mezzanine floors. We believe that wasted vertical space should be utilised, and a mezzanine floor is the perfect option for utilising wasted space, and making the most of it. Our Mezzanine floors are budget-friendly, and can be designed, approved and fitted to a very tight time frame. As well as this, Our mezzanine team has extensive experience of designing and building mezzanine storage areas, warehousing, production facilities, retail areas, offices and showrooms that match your organisation’s requirements exactly. Our superb showroom is located in Melton Mowbray, leicestershire. For more information about mezzanine floors, please call us today using the contact details below.